Home > Lifestyle & Leisure > Why Plant a Tree? A decade or so ago when the idea of carbon offsetting first began to take hold, many of the earliest schemes involved forestry, making use of a woodland’s natural ability to take carbon dioxide out of the air and lock it up. 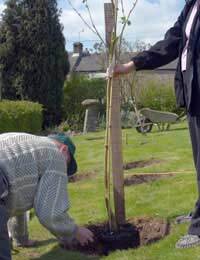 At a much smaller scale too, for many people, the act of planting a tree has an immediate appeal as a practical way to help make a personal offset. However, in recent years, some of the forestry schemes have come in for criticism over the real effectiveness of their role in reducing global warming and many of the formal schemes have moved onto other, more sophisticated approaches. Today, energy efficiency projects in developing countries feature high on the list, promoting a range of locally-appropriate technology from low energy bulbs to wind farms. In light of this, is there really any point in planting a tree? Fortunately, the answer is yes, there is – the reasons for planting them remain as valid as ever, at least for an individual or on a small scale. The principle is simple – as trees grow they photosynthesise, taking in carbon dioxide from the atmosphere and water from the soil, combining them to produce sugar, using sunlight to drive the reaction. All plants make their own food in this way – by photosynthesis – but the relatively larger size of a tree and the amount of sugar it needs to make to sustain itself means that it removes very significant quantities of carbon dioxide from the air. Once extracted from the air, the carbon becomes part of the tree’s body tissue, locked up – “sequestered” – and no longer playing a role in global warming, making a tree a very effective carbon “sink”. The criticism levelled at tree-planting has centred on two points. Firstly, the “sequestered” carbon is not taken out of global circulation forever – or even for the length of time that the shells of marine animals, for instance, hold onto their carbon. Secondly, it has been argued that creating new woodland in some areas may actually speed up, rather than reduce, global warming. It is true that once a tree dies, the carbon it has locked up is gradually released back into the air as it decays, just as will have happened to the carbon in its fallen leaves throughout its life – though on a smaller scale. However, this rather ignores the ripe old age which many trees reach before their demise and if new trees are planted to replace the ageing ones, this problem is largely overcome – not least since the rate of CO2 uptake is greater in growing saplings. On the face of it, the second criticism is harder to dismiss. According to some studies, there is evidence to suggest that in certain areas of the world, the carbon-trapping benefits of trees may be outweighed by their tendency to hold heat at ground level. In addition to reducing atmospheric carbon, trees also transpire water into the air; this increases cloud-cover which in turn helps to reflect some of the sun’s heat back into space, which further helps to cool the planet. This effect is strongest in the tropical regions of the globe, while in cooler latitudes, the winter snows reflect solar energy more effectively – tree cover here will tend to store the heat, rather like a blanket, instead of letting it be lost, warming things up instead of cooling them down. However, for once the British climate may be our saving grace, since most of the studies were done in the United States, where regular snow-fall is a far more dependable regular winter event than in the UK. For us at least, tree planting remains a sound environmental option, especially if we opt for broad-leafed kinds, rather than evergreens – so if it does snow, there are no winter leaves to get in the way. While some environmental organisations argue against the whole idea of carbon offsetting, suggesting that it is little more than “tokenism” and discourages people from dealing with the real problem, tree planting can be a positive start to addressing the carbon issue for ourselves. If nothing else, it shows a willingness to do something – and few gardens, however small, fail to benefit from a tree or two.